Everyone has a vision of what their idea of “the good life” for themselves: I’m waiting for the day when..... I’m looking forward to the day when..... We often fail to realize that God has a vision for our lives, He has a deep desire for each of us as our loving Father. 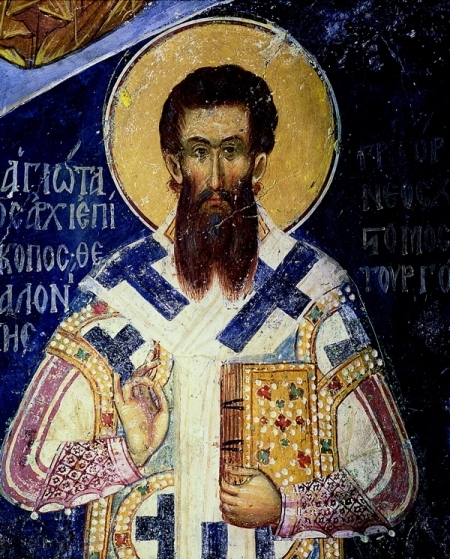 St. Gregory Palamas is one of the greatest saints of our Church because he clearly described and explained God’s vision for our life: to know Him, to experience Him, to share His life, to become one with Him. Essence....engeries....hesychasm....what does this have to say to my life? My life consists of work, mortgage, bills, family. In the midst of our busy lives we need to remember and keep in focus the meaning and purpose of life. Do all the things I experience each day have a higher meaning and purpose? Is there a goal to my life? Another hospice patient that I once visited had a large poster hanging over his bed. The poster pictured a mansion on a hill overlooking the ocean. In the open garage doors were several expensive cars such as a Mercedes, BMW, Lamborghini. The caption on the poster read: “Justification for a Higher Education”. This seemed to be the man’s motivation and goal in life: to accumulate “stuff”. Unfortunately he was dying of cancer and never obtained the house and the cars he was striving for. What he did accumulate was all being left behind. God’s desire for us is something better than an expensive piece of machinery....He wants to know Him, to share His very life, to become one with Him in a relationship that will have no end. This is what St. Gregory Palamas reminds us. This is the purpose of our prayer, liturgical services, fasting, struggling against our sinful passions.